After watching Wednesday night’s match between West Ham and Manchester United I have come to the conclusion that this summer may well be the most important in the career of Andy Carroll. Ever since his move to Liverpool on deadline day of the 2011 January transfer window it would be fair to say Carroll hasn’t asserted himself in the way he would have liked to. Under Kenny Dalglish he was unlucky with injuries and was outshone by his fellow January arrival Luis Suarez. Despite his problems on the field with Liverpool Carroll was instrumental in their FA Cup run to the final last season and his goals in the semi-final and the final were important even if they eventually lost to Chelsea in the final. Carroll ended the season well but his future was once again up in the air with the arrival of the new manager Brendan Rodgers. The Northern Irishman arrived at Anfield fresh from a successful season with Swansea and it was obvious that this was an appointment that was for the long term. Roy Hodgson was brought in to steady the ship whilst Kenny Dalglish was never going to be in charge for more than a couple of seasons. Rodgers, a comparatively young manager has brought in his ideas of total football harking on about teams like Barcelona and Borussia Dortmund. 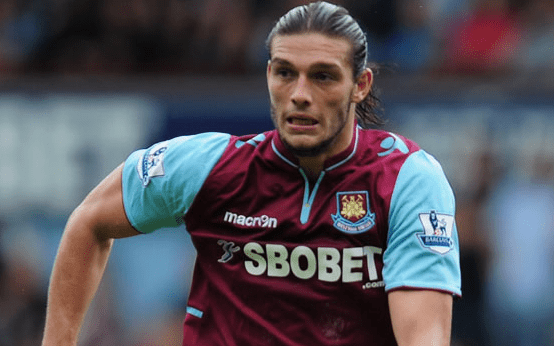 Despite his usage of Danny Graham at Swansea it became pretty obvious fairly quickly that Andy Carroll wasn’t going to be part of Rodgers’ plans at Liverpool and eventually a loan deal with West Ham was struck, importantly with a £17 million clause in the agreement. This move came about despite fierce interest from Carroll’s former club Newcastle, interest which surely will resurface in the summer, but nevertheless West Ham secured Carroll’s services for a year. So far both West Ham and Carroll will be disappointed with the number of games the forward has featured in with injuries dogging the striker once again. However despite his limited appearances there can be no doubting Carroll’s influences in the matches he has played in and the partnership he has struck up with Kevin Nolan has been wonderful to watch. Under Sam Allardyce Carroll has been utilised extremely well making use of the best of his attributes, namely heading and bringing his teammates into the game. His heading ability in particular is one that puts Carroll apart from other strikers such is his arieal prowess. He may not have scored against Manchester United but he was a constant thorn in their defence’s side and he won the initial header that assisted Ricardo Vaz Te’s opener. He may have only returned six goals this season but in terms of leading the line he has done a job Carlton Cole could only dream of achieving. Whilst I think that there is a chance Carroll and Liverpool could work together I do not think it is likely at all. It would be a risk for Rodgers to try and implement a player like Carroll into his current system primarily because of the lack of fluidity. This season his front three of Coutinho, Sturridge and Suarez have shown great understanding in the way in which they change positions and drag defenders out of positions to create space for each other. As good as Carroll is he won’t be able to replicate that and he would have to become the focal point of Liverpool’s attacks should they not sell him. Some part of does think however that playing a sort of front four attacking diamond with Carroll as a striker and those three interchanging behind could be deadly. You would then have to have two very disciplined defensive midfielders behind them and there would probably be no room for Steven Gerrard. This however is all hypothetical and ultimately very unrealistic. In all seriousness Liverpool will probably try and accept their losses on Carroll and look to move him on. This will then allow Rodgers to bring a new striker into the club, one which fits his own style of play. For Carroll then the question is where. The two sides that instantly spring to mind are the one he is currently on loan at and the one he was at before Liverpool. The main problem is that whilst Newcastle could probably afford to re-buy Carroll they are unlikely to be keen to match his current wages. The reverse could be said for West Ham who seem very happy to dish out high wages but there is no chance they will be caught paying £17 million for him. Of course these are not the only clubs linked with Carroll and the likes of Tottenham and Everton have been mentioned in recent weeks although the latter’s interest is extremely questionable at the moment. In my opinion Carroll will leave this summer and I do think he will work his way into England’s squad for the World Cup (should they qualify) but with who is just too tricky to say at this stage. One thing I would be surprised about would be if he moved for £17 million. The £35 million that Liverpool paid Newcastle for his signature was an astonishingly inflated price and injuries and lack of form mean his price has severely dropped. Given those factors I really wouldn’t be paying more than around £10-12 million for Carroll at the most and it is now down to the chairmen and managers in question to strike up a deal that suits all parties. One thing that will not be good for both sides if this time next year Carroll is left rotting in Liverpool’s reserve squad. That would be a shocking waste of his potential. You’re right to say that Carroll’s best option would be West Ham. He has a manager who knows him, a friend and mentor in Kevin Nolan and a life away from Newcastle, where if memory serves, he got into some trouble. West Ham will need to negotiate a better price than £17m, but if they get their man, will recoup the money quickly in Premier League prize money and TV revenues. If Newcastle come after him, West Ham need only remind him that all his mates are with him at the Boleyn.